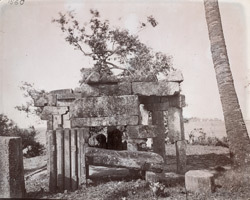 Photograph of the ruined temple at Mandaur, Gaya District, taken by Joseph David Beglar in c.1870s. The temple is located in the modern state of Bihar and is in a ruinous condition. Concerning Mandaur, the Bengal list reads, "The ruins here, six miles north of Gaya on the Phalgu River, consist of a temple of which some pillars are still standing, and some very fine pieces of sculpture. The pillars and architraves are in a dangerous state, and something ought to be done to prevent a collapse and the destruction of what exists...Some of the sculptures are excellent and deserve preservation."